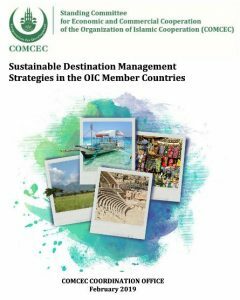 DinarStandard and COMCEC have developed the “Sustainable Destination Management Strategies In The OIC Member Countries” report which was released today at the 13th Meeting of the COMCEC Tourism Working Group, attended by Ministry of Tourism representatives from the OIC Member States. Ankara, Turkey – February 13th 2019 – The purpose of the study was to identify sustainable destination management strategies, compare strategies in the OIC Member States with global best practices, and provide policy recommendations for the OIC Member States. An industry survey, in-depth interviews, and seven country case studies, including three that were field visits, constituted the primary research tools used. Report findings include the critical need for sustainable tourism. Unchecked, tourism growth can have a negative impact on a destination’s natural assets, the environment and local communities. According to the United Nation’s Environment Program, tourism growth to 2050 without further interventions to ensure sustainability, will lead to an increase of 111% in energy consumption, 105% in greenhouse gas emissions, 150% in water consumption, and 252% in solid waste disposal. However, with targeted efforts in the energy and water efficiency areas, emissions mitigation and solid waste management, this scenario could be reversed with a reduction of 18% in water consumption, 44% in energy supply and demand, and 52% in carbon dioxide emissions. Challenges to sustainable tourism strategies implementation include lack of awareness, prioritization of monetary gain over environmental and social issues, inadequate coordination among stakeholders, and inadequate incorporation into wider policies. The report discussed six sustainable tourism strategies and linked them to the UN’s Sustainable Development Goals (SDGs), and well as to the UNWTO’s Sustainable Tourism Goals. The six strategies are (1) Increasing awareness, (2) Protection of natural and cultural heritage, (3) Managing demand and seasonality, (4) Managing environmental impacts, (5) Ensuring community well-being, and (6) Ensuring tourist satisfaction. Facilitate stakeholder engagement at the destination level by establishing an umbrella organization that encompasses government sectors, DMOs, and tourism businesses to streamline sustainable tourism efforts. Conduct media campaigns to increase local community as well as tourist awareness of tourism sustainability. A series of integrated media campaigns utilizing a mix of channels, should be conducted. Establish an OIC-level sustainable tourism monitoring system that tracks each country’s performance against a set of pre-determined indicators and encourages remedial actions when targets are not met. Embrace the Paris Climate Agreement: It is imperative that governments commit to implementing the Paris Climate Agreement that aims to combat climate change, as well as increase the ability of countries to deal with the impacts of climate change. Create a Culture of Sustainable Entrepreneurship by setting policies and providing incentives that encourage the establishment and growth of local tourism businesses. The report can be downloaded in full from COMCEC’s website. DinarStandard™ is a growth strategy research and advisory firm empowering organizations for profitable and responsible global impact. Our focused markets are: OIC economies, Halal/Ethical food and lifestyle sectors, sustainable tourism, Islamic finance, impact investment, and NGO’s/Non-Profits. The Standing Committee for Economic and Commercial Cooperation of the Organization of Islamic Cooperation (COMCEC) is the main multilateral economic and commercial cooperation platform of the Islamic world. COMCEC serves as a central Forum to address the common development problems of the Islamic Ummah and provide solutions for them. The COMCEC Tourism Working Group (TWG) serves as a regular platform for producing and disseminating knowledge, sharing experiences and good practices, creating a common understanding and approximation of policies among the OIC Member Countries in this important sector.